The HEINKEL Drying and Separation Group offers complete onsite inspection services for all brands and models of centrifuge bowls. It is generally recommended that once a centrifuge machine has been in operation for 15 years a complete and full inspection of the bowl/basket should be conducted. In order to detect any potential problems or damage, HEINKEL experts can perform various onsite tests such as liquid dye penetrant, ultrasonic, vibration, balance, and radiographic. Recently we completed a project with a worldwide leading manufacturer of collagens and gelatins operating two 1725mm size bowl non-Heinkel brand centrifuges that required replacement bowls. 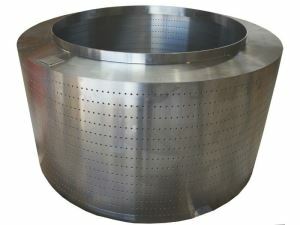 We replaced these bowls made from newer and stronger Duplex stainless steel material, incorporated newer design features, and manufactured the bowls to today’s most current EN1247 design guidelines for centrifuge bowls, giving the customer an up to date design and more reliable solution. Regardless of your centrifuge brand or model, with our know-how and experience Heinkel is able to provide customers with solutions which will increase safety, efficiency and profitability of production plants.